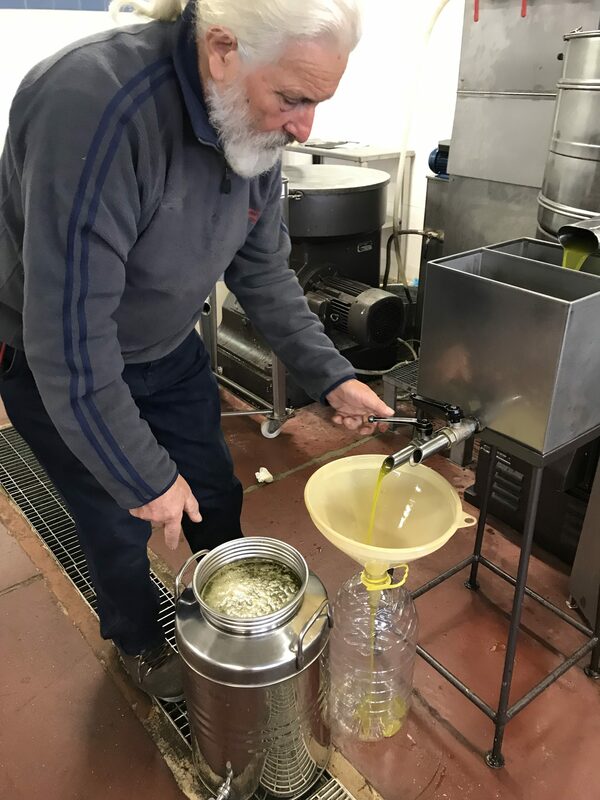 The Green Gold of Umbria: Our Olive Oil’s In! They called us into the olive mill yesterday: it was our turn. Pressing time for our 300 k+ of olives which we’d hauled in the day prior. Delivery of our olives to the mill, the day before the pressing..
We headed there immediately: anyone consigning olives to the mills must absolutely be there at pressing time. Each must have their own oil from their own olives: not even the intrusion of a kilo or two of the olives of a neighbor perhaps pressing at the same time! Olives were arriving via tractor and immense shiny stainless steel canisters of just-milled olive oil were heading home in mini-trucks, Api. …..and the yield was even more than we’d anticipated: the containers we’d brought wouldn’t suffice…. Ah, the pride and joy on your faces makes this clear. So wish we were there. Wish you were here, too! More than you expected – that’s great! I see you are using the netting method, southern Italy style. Your story told step by step let’s us feel we’re there as it’s happening. Lively writing! Oh, how I wish I was there for the harvest and pressing! How long will the olive oil last for you, Pino and guests! Such a beautiful color, truly liquid gold! Dear Annie and Pino, congratulations on your glorious harvest! And what an international crew of helpers – I’m sure they enjoyed their experience. Such a difference than grabbing a bottle of olive oil (usually something sub-par here in the US for the uninformed) off the shelf). Can’ T wait for our first taste! June can’t come too soon! Lyn, Christine and Bev – grateful for toru comments..now come for bruschetta! thanks for your comments..and now…come for bruschetta! oooops//sorry for doubled comments! – was told “not taken”. Kathy S, we’ll probably use all 52 litters this year! Ann C, yes, an international group this year and I think they enjoyed the picking – we were delighted to have them with us! What a fantastic experience – it was so beautiful and peaceful out among the olive trees in such glorious weather. The end product was delicious also!! We thoroughly enjoyed it, thank you Pino and Anne! Thanks, Ian and Jenifer, for your good work – glad to have you with us!